In honor of Berry Day and the Berry Pie contest, here’s a reprint of Sandy Venzie’s super easy pie crust recipe. She did a demo at the Market last fall. Put shortening in a bowl and cover with the boiling water and milk. Break up the fat with a fork. 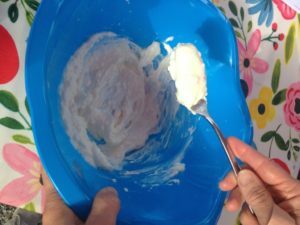 Tilt the bowl and beatwith the fork until smooth and soft peaks form-like whip cream. Sift in the flour and mix quickly with round the bowl strokes until a dough forms that pulls away from the bowl. Remove from bowl and pat into a flat round. Refridgerate for 1/2 hour to 3 days.Divide in half and roll out. Good luck at the pie contest! This entry was posted in Recipes and tagged cooking, pie, recipes. Bookmark the permalink. ← Grayson LandCare Rocks the River July 29th!